To understand the meanings of the electrical terms "line" and "load," it helps to recall the cliché, It's all relative. Line and load refer to the power connections coming into or out of electrical devices in the scheme of your electrical system. It's all relative because, in many cases, the load wire of one device is the line wire of the next device in the circuit. In this way, the terms can generally be thought of as "incoming" and "outgoing." The incoming feed from the utility company comes into the line side of an electric meter. It leaves the meter from the load side and then feeds the line side of a disconnect or electrical service panel. The service panel also has line and load connections. The line feeds the main breaker in the panel, while the individual branch circuit breakers can be considered the load, with respect to the main breaker. Outlets (receptacles), switches, light fixtures, and other electrical devices typically are wired in multiples on a single circuit. With the first device, the line is the wire running from the service panel to the device, and the load is the wire running from the first device to the second device downstream on the circuit. At the second device, the line is the power source coming in from the first device; the load is the wire going out to the third device on the circuit, and so on. The same meaning can apply to the device itself. The line side of an outlet is where you connect the incoming source power. The load side is where the power leaves the device (or electrical box) and travels down the circuit. Line and load have special meaning when wiring ground-fault circuit-interrupter (GFCI) outlets. GFCIs have two pairs of screw terminals for connecting wires: one pair is marked LINE, and one is marked LOAD on the backside of the outlet. Connecting to the line terminals only results in the outlet providing GFCI protection only for that outlet. 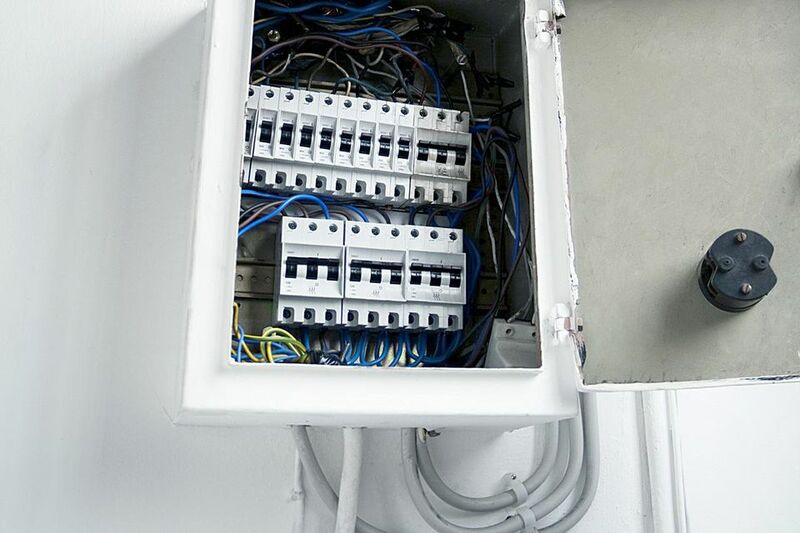 Connecting for the line and the load terminals (using two electrical cables or two sets of pigtail wires) provides GFCI protection for that outlet and for other standard (non-GFCI) outlets downstream on the same circuit. GFCIs help protect against shock by sensing slight imbalances in the circuit and shutting off the power at the outlet automatically. When wiring low-voltage circuits, such as those supplying doorbells or landscape lights, "load" refers to the parts of the circuit that are at full household voltage (usually 120 volts), to distinguish them from the low-voltage wiring and devices that are used after the voltage is stepped down at a transformer. Load is also a general term to describe the electrical demand, or power draw, a device or appliance has on a circuit. For example, on a lighting circuit, you would add up the maximum wattage of all of the light fixtures on the circuit to calculate the "total load," or maximum potential power demand of all the lights.